Climate projections displayed in this map represent the average of the maximum air temperature (degrees F) for June, July, and August for the years 2010-2080 using current data, or one of two IPCC greenhouse gas concentration scenarios: a moderate emissions scenario (RCP 4.5) and a high emissions scenario (RCP 8.5). These datasets are intended to represent typical summer temperatures in the decade indicated. The range of temperatures shown correspond to approximately 70 - 90 °F or 20 - 35 °C. Climate projections were developed by a University of Massachusetts Amherst team for the Northeast region to evaluate the potential effects of climate change on wildlife habitat and ecological integrity from 2010 to 2080. Data courtesy of the North Atlantic Landscape Conservation Cooperative. The Earth’s climate is warming. Global average annual temperatures have increased by 1.5°F since 1895, and the vast majority of this increase has occurred since 1980. The northeast United States has experienced an increase in annual temperatures of 1.6°F over the last century. Warming has been occurring during all seasons, but has been greatest during winter (0.24°F/decade). Warming is also greatest at higher latitudes, elevations, and inland from the Atlantic coast. Future climate projections consistently show continued warming over the 21st century across Massachusetts and the entire New England region. All climate models agree that the warming trend will continue over the coming decades with high emission scenarios giving the greatest warming. However, for a given emissions scenario, the exact magnitude of warming varies slightly depending on the models used and their structure. Massachusetts is projected to see average temperature increases that exceed the global average, with potential warming of around 5°F annually by mid-century under a high emissions scenario. Model projections of future seasonal changes generally suggest winter will continue to show the greatest amounts of warming with increases up to 5°F by mid-century. Extreme temperatures in the form of heatwaves may become more frequent, more intense, and last longer. Extreme high temperature events are on the rise globally. Warmer night-time temperatures are driving this overall trend with fewer cold nights and more warm nights. However, there is evidence of a “warming hole” over the past half century across the eastern U.S., where the number of warm days has been either constant or slightly decreasing and the number of cool days increasing. Heatwave intensity, frequency, and duration are expected to increase over the U.S. in the 21st century. Fewer cold days and nights, and more warm days and nights are also expected over the 21st century. Minimum temperatures (daily lows, temperature on the coldest day of the year) are rising, and are expected to continue to rise faster than maximum temperatures (daily highs, temperature on the warmest day of the year). The highest elevations in Massachusetts and the greater New England region are likely to see large increases in daily summer maximum and minimum temperatures in the future. Extreme cold winter temperatures in Massachusetts and the Northeast region observed during recent years are thought to be the result of rapid warming in the Arctic, which influences the strength and meandering of the jet stream. These anomalous cold temperatures were the exception as the rest of the world experienced record high temperatures. Studies of these extreme temperature events are an emerging area of climate research. Recent research suggests that it is likely that North America will experience additional extreme winter temperatures, though they are expected to vary in intensity and frequency over time. Growing degree days and the overall growing season length is generally defined as the number of days between the dates of the last spring frost and the first fall frost. Frosts occur when the minimum daily temperature drops below freezing (32 °F). Between 1895 and 2011, there has been a strong increase in growing degree days in Massachusetts and the greater New England region due to shorter winters and longer summers. The growing season has lengthened in Massachusetts by approximately 10 days since the 1960s. The average date of the last frost in spring has been getting earlier each year, and the date of the first frost in fall has been getting later across New England. 1. Alexander, L. V., et al. 2006. Global observed changes in daily climate extremes of temperature and precipitation. Journal of Geophysical Research 111:D05109. 2. Donat, M. G., et al. 2013. Updated analyses of temperature and precipitation extreme indices since the beginning of the twentieth century: The HadEX2 dataset. Journal of Geophysical Research: Atmospheres 118:2098-2118. 3. Fischer, E. M. and R. Knutti. 2015. Anthropogenic contribution to global occurrence of heavy-precipitation and high-temperature extremes. Nature Climate Change: doi:10.1038/nclimate2617. 4. Diaz, H. F. and R. S. Bradley. 1997. Temperature variations during the last century at high elevation sites. Climatic Change at High Elevation Sites. Springer:21-47. 5. Diaz, H. F., R. S. Bradley, and L. Ning. 2014. Climatic changes in mountain regions of the American Cordillera and the tropics: historical changes and future outlook. Arctic, Antarctic, and Alpine Research 46:735-743. 6. Francis, J. A., and S. J. Vavrus. 2015. Evidence for a wavier jet stream? in response to rapid Arctic warming. Environmental Research Letters 10: 014005. 7. Hayhoe, K., C. Wake, B. Anderson, X.Z. Liang, E. Maurer, J. Zhu, J. Bradbury, A. DeGaetano, A. M. Stoner, and D. Wuebbles. 2008. Regional climate change projections for the Northeast USA. Mitigation and Adaptation Strategies for Global Change 13:425-436. 8. Hayhoe, K., C. P. Wake, T. G. Huntington, L. Luo, M. D. Schwartz, J. Sheffield, E. Wood, B. Anderson, J. Bradbury, and A. DeGaetano. 2007. Past and future changes in climate and hydrological indicators in the US Northeast. Climate Dynamics 28:381-407. 9. Kunkel, K. E. 2013. Regional climate trends and scenarios for the US National Climate Assessment. US Department of Commerce, National Oceanic and Atmospheric Administration, National Environmental Satellite, Data, and Information Service. 10. Meehl, G. A. and C. Tebaldi. 2004. More intense, more frequent, and longer lasting heat waves in the 21st century. Science 305:994-997. 11. Ning, L., E. E. Riddle, and R. S. Bradley. 2015. Projected Changes in Climate Extremes over the Northeastern United States. Journal of Climate 28:3289-3310. 12. Pepin, N., et al. 2015. Elevation-dependent warming in mountain regions of the world. Nature Climate Change 5:424-430. 13. Pepin, N. C. and J. Lundquist. 2008. Temperature trends at high elevations: Patterns across the globe. Geophysical Research Letters 35:L14701. 14. Perkins, S. E., L. V. Alexander, and J. R. Nairn. 2012. Increasing frequency, intensity and duration of observed global heatwaves and warm spells. Geophysical Research Letters 39:L20714. 15. Rawlins, M. A., R. S. Bradley, and H. F. Diaz. 2012. 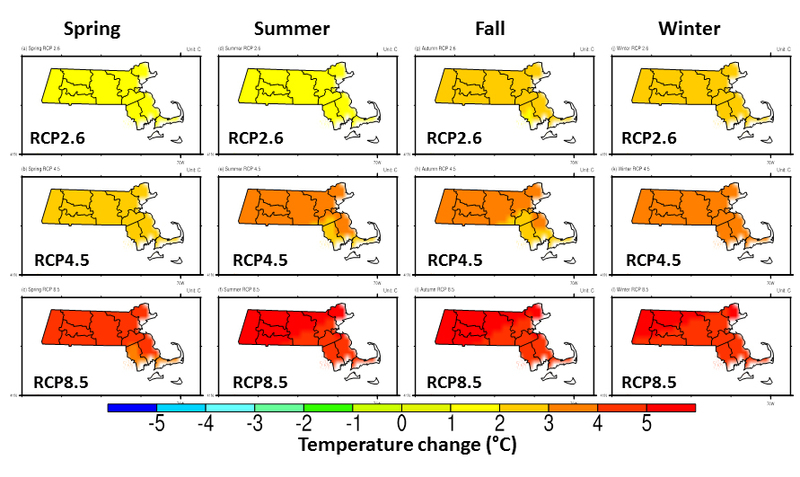 Assessment of regional climate model simulation estimates over the northeast United States. Journal of Geophysical Research: Atmospheres 117:D23112. 16. Sillmann, J., V. Kharin, X. Zhang, F. Zwiers, and D. Bronaugh. 2013. Climate extremes indices in the CMIP5 multimodel ensemble: Part 1. Model evaluation in the present climate. Journal of Geophysical Research: Atmospheres 118:1716-1733. 17. Thibeault, J. M. and A. Seth. 2014. Changing climate extremes in the Northeast United States: observations and projections from CMIP5. Climatic Change 127:273-287. 18. Walsh, J., et al. 2014. Chapter 2: Our Changing Climate. Climate Change Impacts in the United States: The Third National Climate Assessment. J. M. Melillo, T. (.C.). Richmond, and G. W. Yohe (eds.). U.S. Global Change Research Program:19-67.